As our crops become ready to harvest, we encourage anyone to pick your own. As long as you record what you take! 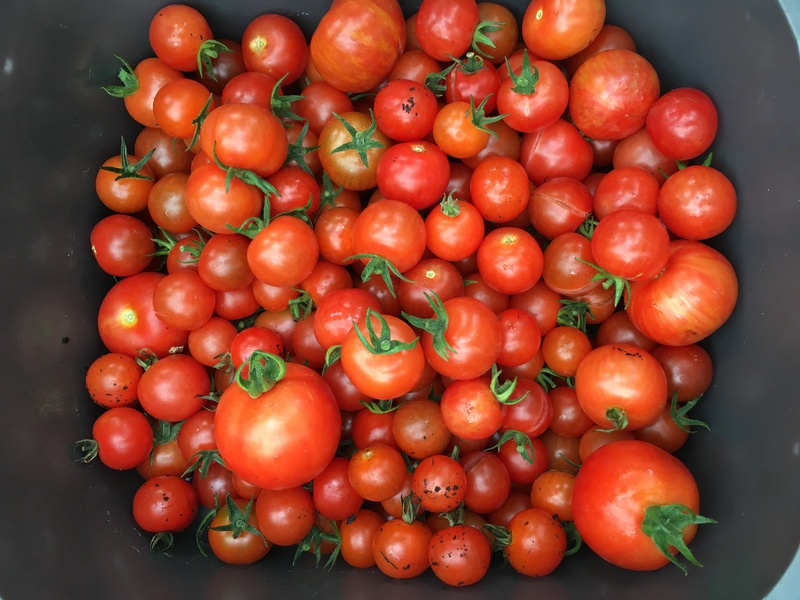 We aim to have a large variety of food all year round from apples and plums to winter salads, summer fruits and the much loved hot house crops of tomatoes and cucumbers grown at the Greenhouse at the St Andrews Botanic Garden. If you are not sure what is ready or how to pick it, why not come along to one of our many garden sessions to ask any questions you might have? Alternatively, look out for the ‘Eat me, I am ready!’ signs made by some of our volunteers. Eating seasonal food whether it is from the garden or supermarket means that it can be sources closer to home and therefore less miles are required for that food to arrive at your plate. Here is a list of what you can expect to harvest throughout the seasons. Click the lick on Food for some of our favourite recipes! Cabbage, Leeks, Rhubarb, Kale, Radishes, Celeriac, Purple-sprouting broccoli, Green onions, Parsnips, Spinach, Chard, Garlic and more! Marrow, Sweetcorn, Tomatoes, Cucumbers, Leeks, Cauliflower, Pumpkin, Swede, Courgettes, Potatoes, Beans, Red Cabbage, Kale, Plums, Raspberries, Pears, Apples, Gooseberries, Blackberries, Wine-berries, Chard, Spinach, Salad Leaves and more! Recording our harvest each year is essential to what we do as we aim to reduce carbon emissions. Growing and eating food that is locally sourced means that we are consuming less imported foods which have a higher cost to the environment. It is estimated that for every ton of food we grow we save 1 ton of carbon from reaching the atmosphere. At each garden site there is a recording station either in a box, a shed or a toll storage unit. There is a scale and a note book to record what you’ve picked and how much it weighs. Throughout the year, we add these figures up to get a total of all the garden sites and how much carbon we have saved. In addition to the Edible Gardens, we also spend time in a few of the Community Orchards including St Leonard’s Orchard and Stanks park where we collect, weight and share the glut of apples available in St Andrews. In the winter season we return to the Orchard to learn how to prune fruit trees at The Apple Pruning Skillshare and help maintain the orchard. HOW Much Food Does Edible Campus Grow? Another good year after a fairly cool spring we had a warm summer and very mild autumn. Albany Park had an incredible year and nearly doubled the volume of food produced whilst most site’s recorded a small increase. Most noticeable was an increase in rhubarb, berry fruits and beans in the harvest although Strawberries did not seem to have as good a year as 2014 – which was exceptional! We had a bumper harvest this year after a very mild winter, warm spring and scorching summer (for Fife anyway) which, alongside new gardens opening at Uni Hall and the Botanic Gardens greenhouse, helped bring our grown harvest up to 350kg. The orchard harvest was down quite a bit though with only 230kg harvested from St Leonards and a further 30kg from the Careers centre garden bringing our total annual harvest to 612kg. We harvest 520kg this year of which 180kg were vegetables grown across the campus and the rest was fruit harvested from the Old St Leonards School Orchard and distributed to halls. Potatoes made up the bulk of the harvest (103kg) with salads coming in at 20kg and most other veggies being less than 10kg. In terms of value the salads and soft fruits would probably head the list along with the huge amount of apples. At the start of the year we were growing on around 100m2 of ground at 3 sites and now have over 260m2 at 6 sites. Next year we would like to double the growing area again through adding a further 3 sites at Gannochy, Uni and John Burnett halls. The majority of the work is carried out by volunteers who enjoy the opportunity to do some physical activity, learn a few skills and have the satisfaction of growing food. Its hard to keep track of all those that spent time in the gardens but we have at least 70 people who registered at the sessions and harvest whatever is ready. That averages out at nearly 3kg veg per volunteer.